A group of Brazilian authors have made a comprehensive study on the succineid genus Omalonyx, with interesting results. This is a well-executed study that uses different methods to formulate several hypotheses. The best-supported one leads the authors to conclude that there are two species to be recognised: O. convexus (Martens, 1868) and O. matheroni (Potiez & Michaud, 1835). This result is interesting, the more since this group is extremely difficult to study using the morphology alone. Such integrative studies are thus the way forward, and should be attempted also for other groups of Neotropical snails. Vidigal, T.H.D.A. et al., 2018. 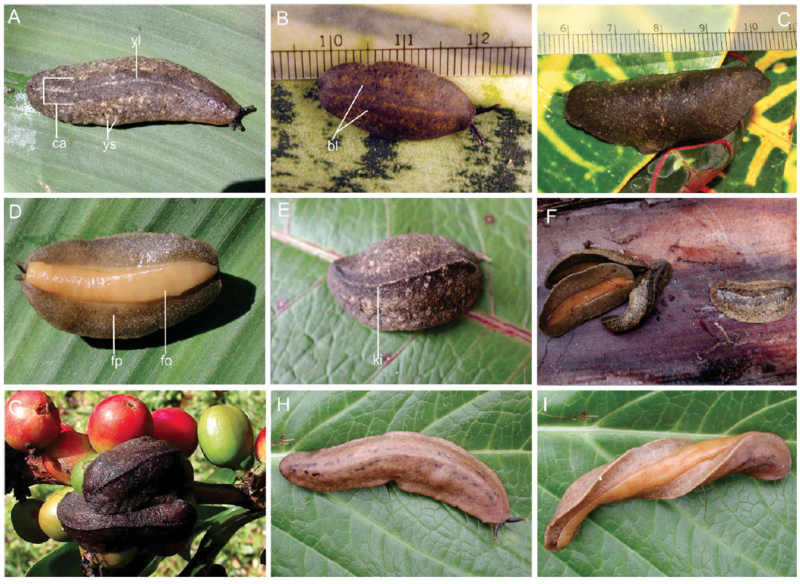 Integrative taxonomy of the neotropical genus Omalonyx (Elasmognatha: Succineidae). – Zoologica Scripta, 47 (2): 174-186. This entry was posted in Uncategorized and tagged dna, literature, phylogenetics, succineidae, taxonomy on July 26, 2018 by bramb. Already some months ago, Thomas Watters published a new revision dealing with Hispaniolan annulariids (Watters & Larson, 2017). “The annulariid genera Chondropomella, Chondropomium, and Clydonopoma are believed to have originated from the Tiburon/Barahona Peninsula in isolation from the rest of Hispaniola. Chondropomium has colonized the rift valley and adjacent river valleys between the Tiburon Peninsula and the remainder of Hispaniola. It is primarily limited to xeric lowlands, rarely found above 200 m elevation. Little is known about the rare Chondropomella but they seem to occur in the rift valley in xeric areas as well. In contrast, Clydonopoma is endemic to the Sierra Baoruco with a single species in the adjacent eastern Massif de la Selle and occupies the upland mesic forests and pine savannahs between 200–4000 m. The most widely distributed species, Chondropomium weinlandi, has been the subject of considerable confusion concerning the nature of its many color forms or subspecies, as well as its valid name. This species was investigated using phylogenetic methods and compared to congeners and related genera. A phylogenetic study aimed at elucidating relationships among these taxa analyzed a partitioned matrix of nuclear (ITS 1) and mitochondrial (CO1, 12S, 16S) DNA sequences in a Maximum-likelihood framework under the GTR+G substitution model. Contrary to Bartsch’s 1946 assessment that C. weinlandi is a complex of subspecies, it is here shown to be a single, highly polymorphic species for color. The new genus Superbipoma is recognized based on phylogenetic, radular, and conchological evidence. It contains two species: S. asymmetricum (Henderson and Simpson, 1902) and S. superbum (Pilsbry, 1933). Eleven species of Chondropomium are recognized including two new species: C. caelicum and C. sardonyx; three species of Chondropomella and nine species of Clydonopoma, including one new species, Clydonopoma titanum, are recognized. A calcified operculum is the ancestral condition for the Annulariidae. In Clydonopoma and Chondropomella the operculum is a particularly complex calcified structure termed the pseudolamella. This structure has been lost in Chondropomium and Superbipoma”. As usual, this paper is very thorough, well organised and includes a phylogenetic study based on a multi-locus analysis. Watters, G.T. & Larson, P., 2017. A revision of the Hispaniolan genera Chondropomella, Chondropomium, and Clydonopoma (Gastropoda: Annulariidae), with the recognition of a new genus, Superbipoma: phylogenetic, radular, and conchological evidence. – Nautilus, 131 (3):163-201. This entry was posted in Uncategorized and tagged annulariidae, dna, literature, West Indies on March 5, 2018 by bramb. Jaramillo et al. (2014) recently published a paper which combined anatomical and molecular research on Megalobulimus oblongus (Müller, 1774) (Strophocheilidae) from Colombia. 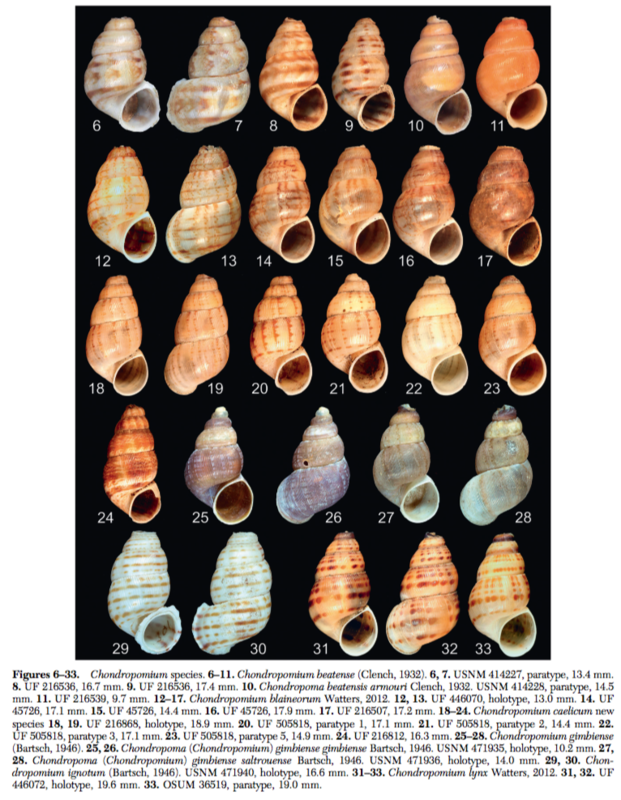 The abstract reads: “In this work was done morphological and molecular analysis to 28 land snails of Megalobulimus oblongus, collected in different departments of Colombia, deposited in a reference collection. For morphological characterization, the animals were dissected in a stereomicroscope. The reproductive system and the shell were described. Measures were taken to structures of the reproductive system. Of the shell were described its shape, color, number of whorls and ornamentation and equally basic measures were taken using a digital caliper. For molecular analysis were used two mitochondrial markers, 16S rRNA and cytochrome C oxidase subunit I (COI). Only one haplotype was obtained for each marker, even for individuals of different and distant biogeographical regions. This study suggests that M. oblongus is in danger, therefore are urgent investigations about reproduction, population genetics and biogeography to clarify its situation in Colombia. It also demonstrates that the reference collections and tissue banks are sources of valuable information since they allow knowing aspects related with the species’ risk that serve as an input for the design of conservation actions”. The Colombian specimens were collected at six different sites, three of which are in Dept. Antioquia, and one in adjacent Caldas; two originated from the eastern departments. The genetic invariability found was linked to human transportation due to illegal trade. The conclusion that this species, widespread in South America, in endangered in Colombia seems premature. Not all species need to be conserved everywhere anytime in any political-administrative region; this might be a misconception of what biodiversity really is. 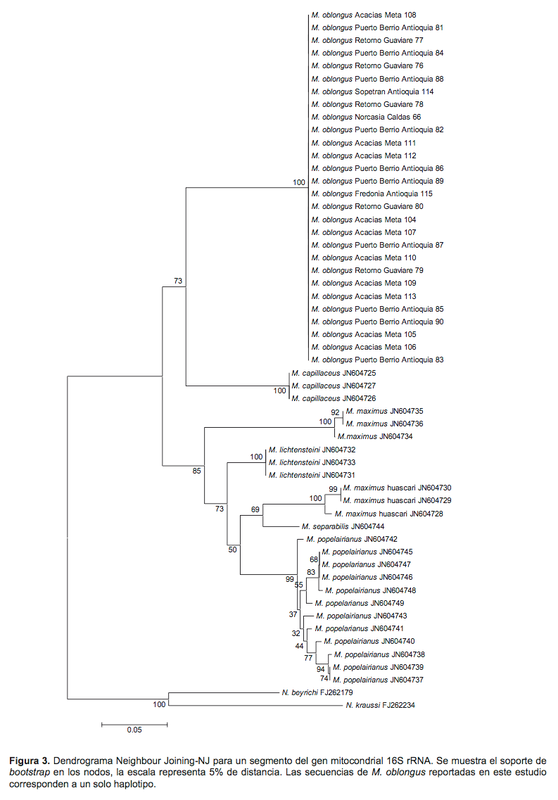 The data in Table 2 can be supplemented with the locality of Megalobulimus parafragilior Leme & Indrusiak, 1990: Brazil, São Paulo, Peruibe (MZSP 86740), as mentioned in the source from which the sequence was derived. This entry was posted in Uncategorized and tagged anatomy, colombia, dna, literature, megalobulimus, phylogenetics on July 10, 2014 by bramb. A paper that appeared already last year is Pedro Romero’s study on Systrophia from Peruvian Amazonia (Romero & Ramirez, 2011). DNA barcoding analysis is based on the comparison of genetic distances to identify species using a segment of Cytochrome C Oxidase I (COI) gene. 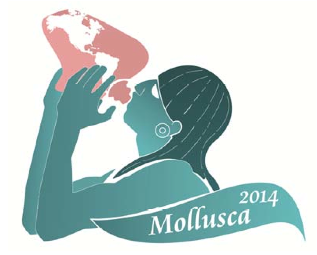 Species identification through DNA barcoding challenges problems in groups with high genetic diversity as molluscs. Thus, our aim was to estimate intraspecific divergence in the Amazonian land snail Systrophia helicycloides (Gastropoda, Scolodontidae) and evaluate the use of DNA barcoding in molecular identification of this land snail. Nucleotide sequences were compared with Genbank and BOLD (Barcode of Life Data Systems) databases. We conducted distance analyses using the Neighbour Joining method. Systrophia helicycloides showed two groups of haplotypes and intraspecific genetic distances higher than 4%. We observed an overlap between intraspecifical and interspecific distances. The high divergence may be related to rapid mutation rate in the snail mitochondrial genome, to population distribution that influences genetic isolation and differentiation, and to ancestral DNA polymorphisms. COI profiles uploaded in BOLD are the first records of this species and can identify Systrophia helcycloides from other species. 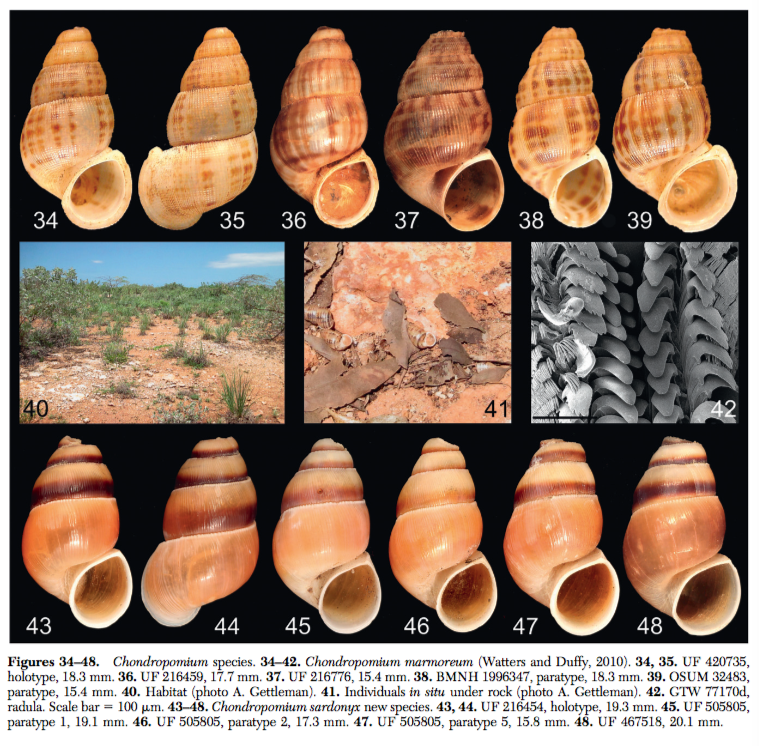 These profiles corroborated the high variation in the land snail genome. Therefore, species identification in this group needs a combined analysis of genetic distances, informative sites, and conventional taxonomy. Romero, P. & R. Ramirez, 2011. 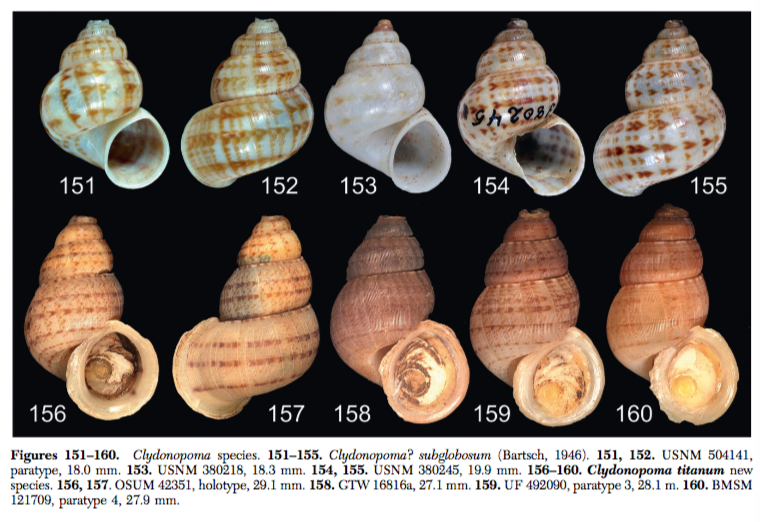 Divergencia intraespecifica y codigo de barras de ADN en Systrophia helicycloides (Gastropoda, Scolodontidae). – Revista Peruana de Biologia 18(2): 201-208. This entry was posted in Uncategorized and tagged dna, scolodontidae on March 23, 2012 by bramb.